12S is an extract of birth certificate, issued once in a lifetime, on a special and secured paper, this document is compulsory for the issuance of the biometric passport. Algerian Citizens residing within Finland can apply for the Birth Certificate 12S. The Embassy in Helsinki by filling a descriptive form (please contact the Embassy) and booking an appointment at the Embassy. Please call or book directly via this link. The birth must be already transcribed at the Algerian Embassy in Helsinki. If the Birth of the child has not been transcribed at the Embassy, please refer to the Birth Registration. 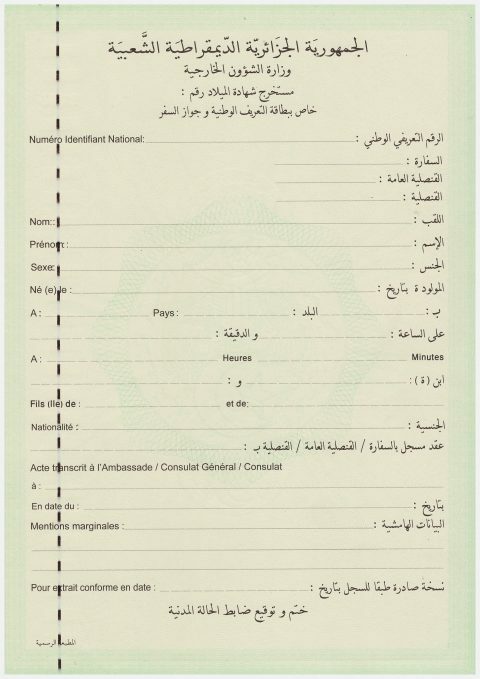 Copies of the parents Algerian ID (passport /ID/Consular Card) . Copy of the family book (if you have one).